Full Water Culture Update + My First Fall Spike! Well, as per usual it’s been a very long time since my last post! I was waiting to do an update on my full water culture experiment but not a whole lot was happening so I kept waiting…and waiting. 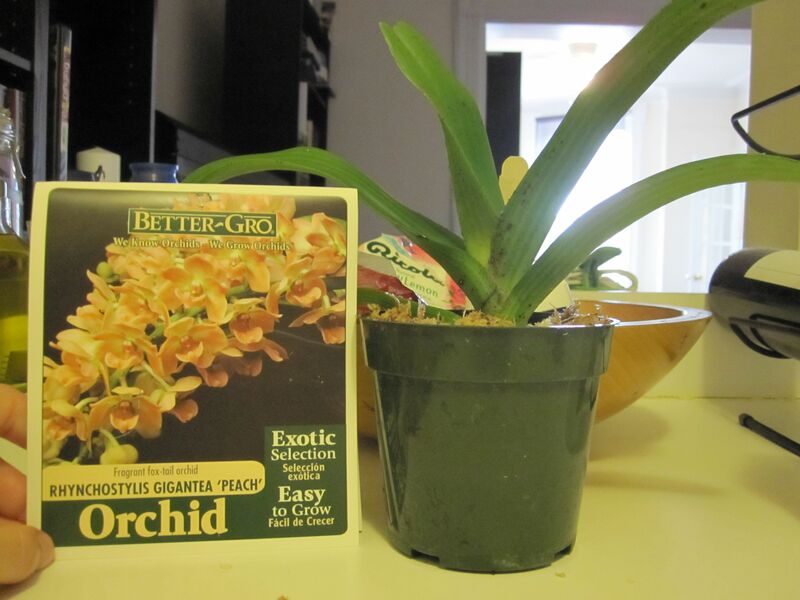 Even though I don’t have anything mind-blowing to share, I finally decided to write a post to show the orchids’ progress since I started the experiment in mid-May. I went to Lowe’s on an errand for my boyfriend this weekend and when I saw that they had received a new shipment of Better-Gro orchids, it was pretty much inevitable that I would walk out of the store with at least one. I ended up selecting a Rhynchostylis Gigantea ‘Peach’ that looked pretty healthy from what I could see through the packaging. As I’ve discovered with my other Better-Gro purchases, the potting medium was pretty gross. So I repotted the plant with fresh sphagnum moss when I brought it home and trimmed away a few rotten roots. I’ve never grown a Rhynchostylis before, so this is a first for my orchid collection. Let’s hope that I can get this baby to bloom!